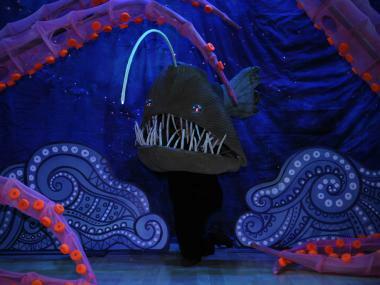 A fish puppet in Luna's Sea, at the AMNH on May 11, 2012. UPPER WEST SIDE — The stars of the newest installation at this museum are supposed to be the fish and other creatures that glow from within, all by themselves. Those beasts take a back seat this weekend, as a live-puppet theater production debuts onstage at the Kaufmann Theater, part of the American Natural History Museum. Bright colors, dynamic lighting, and riveting dances help the story behind a new exhibit at the AMNH, called "Creatures of Light: Nature's Bioluminescence," come to life in a way that no squishy invertibrates could. The show, "Luna's Sea," celebrates the mystery and exotic appeal of bioluminescent species in a larger-than-life way, using puppetry, optical illusions, and black-light theater. The actors portray a young girl's ocean journey, from the shores of Africa to the deep sea hideaways where bioluminescent creatures live. Put on by Mystic, Conn.-based Stringpullers Productions, the show scheduled two performances each day, May 12 and May 13, at 11 a.m. and 2 p.m.
For more information, visit http://www.amnh.org or call 212-769-5100. Tickets are $22, and the entrance to the theater is at 77th Street, between Central Park West and Columbus Avenue.